GRASSED: Peri Stavropoulos with a brown trout from a creek near Apollo Bay. Snapper fishing continued to be a priority for most over the past week. Corio Bay’s inner-harbour area known as the ‘spoil grounds’ produced fish to 6kg on bait. Other anglers even found fish to 4kg while drifting and casting soft plastics. The channel off Clifton Springs was again productive, especially around the bend, with squid, silver whiting and pilchards all used as bait. Massive schools of salmon were present throughout the bay. Boat anglers found them feeding over the weekend out the front of Point Wilson, where casting metal lures and soft plastics into the commotion accounted for salmon to 1kg. Pinkies were caught in the inner-harbour around the waterfront. Areas like the outside of the yacht club or Eastern Beach’s promenade held fish to 40cm, with soft plastics and baits like pilchard chunks or bluebait working well. Silver trevally, pinkies and small salmon were caught in Queenscliff Harbour, especially along the section known as ‘The Cut’. Fishing an hour either side of a slack tide made things easier, while soft plastics and baits like squid strips or pippies worked well. The squid fishing was still on fire, with quality bags taken from the weed beds off Clifton springs right around to Queenscliff. Artificial jigs in natural whiting and plain white colours were successful, although Point Lonsdale Bight continued to produce the much bigger models and mostly on baited jigs weighted to manage the deeper water. The Great Ocean Road continued fishing well, not only for salmon off the beaches and rock platforms but for bream and trout in the estuaries as well. Painkalac Creek, at Airey’s Inlet, produced bream on small pieces of prawn or scrubworms, while bigger fish are often caught using small freshwater yabbies. 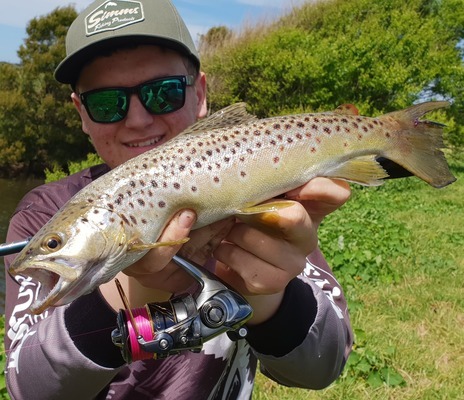 Further along the coast, Peri Stavropoulos and friend Owen fished the small creeks surrounding Apollo Bay for a catch of estuary perch, bream and brown trout on unweighted scrubworms.